Diet: Does it Help Rheumatoid Arthritis? There is often controversy as to whether or not diet is helpful in treating rheumatoid arthritis and other autoimmune diseases. Many folks believe there is absolutely nothing to what you consume while others believe it is what will save them. After years of trial and error with diet, I am no longer convinced it is going to save me from rheumatoid arthritis, but I definitely believe it plays a huge part in how I feel. Over the years I have experimented a lot with diet, sometimes to the point that I was so stressed about what I was eating that I added to the pain in my joints because of the stress I was putting myself under to eat perfectly. For more than a year now, I have been following a diet known as the paleo/primal diet. Many in the movement call it a "lifestyle" rather than a diet and that is exactly what it is for me. It is a way of life with many different ingredients. Each of these ingredients follows a direction that I have been moving towards for the last ten years. These ingredients are perfectly wrapped up in the philosophy of the paleo/primal diet and I find this movement makes me feel right at home. The main ingredient to this "lifestyle" is of course diet. Although I have been gluten and dairy free for eight years now, my diet surprisingly became easier/less stressful when I eliminated grains and legumes completely. By eliminating these foods, I stopped looking for replacements that were gluten free. I no longer need to have gluten free bread to replace the regular breads. Instead I focus on real foods that taste as they were intended to taste. It is amazing how many ways you can make different dishes of meat, veggies, herbs/spices and plenty of healthy fats. I have become a better cook this last year because I enjoy the foods I eat and they are simple to prepare. Also included in this diet is a reduction of sugar which I still battle with some days, but overall feel is under control. I found out years ago when I eliminated sugar from my diet for almost nine months and then brought it back, that it creates huge problems for me. Overconsumption almost guarantees my hands will be stiff the next morning. Before rheumatoid arthritis became a part of my life, I was already making positive food choices that have become very important political/food issues to me over the years. Besides eliminating the majority of processed foods from our diet, I found a farmer that produces beef, chicken, pork, and lamb as well as eggs from animals that are free to roam and enjoy the outdoors. This is important to me. The current leaders in the paleo/primal lifestyle focus on these issues and not only encourage eating animal products from animals treated well, but also provide a lot of education on the issue. I like that the paleo/primal community provides a place for me to find like minded people. I love reading about health and especially health topics that lead me in a positive direction. With the paleo lifestyle community I have found podcasts, blogs, websites, and more to satisfy my thirst for educating myself in the lifestyle I have adopted. Exercise has always been important to me, before rheumatoid arthritis and during. There have been days, weeks, and even a couple of years where very little exercise happened. When I was not able to do full blown workouts, I often felt this disease had taken over. Then I started reading Mark's Daily Apple. At the bottom of his fitness pyramid I found "move frequently at a slow pace." Hey, who with RA hasn't found this to be easy? Moving at a slow pace is definitely something I can always do. My slow pace may not be what Mark's slow pace is but for my down days it works great just knowing that I am moving and still following a fitness pyramid. Plus, each morning that I walk with my border collie, I know that I am doing good things for myself. I am not just "moving at a slow pace" (actually these days I am moving at quite a bit faster pace! Yay for me!) but I am getting outside and soaking up some vitamin D which is highly recommended in the paleo/primal lifestyle, enjoying time with my border collie, and letting my mind slip into worlds other than rheumatoid arthritis. For me walking is the perfect exercise. Now that I am feeling better, I have incorporated weights back into my workout routine. Carving out 30 minutes three times a week helps give my body balance and strength for the days rheumatoid arthritis has a strong presence in my joints. And although I don't sprint every week as recommended by Mark's Daily Apple, I do so when my knees give me permission and let me tell you, it is exhilarating. My border collie takes off and for those few seconds, her excitement makes me laugh out loud. I know these few simple additions to my life are doing so many good things for not only me, but for my border collie also and that makes me happy. Even she follows a paleo/primal lifestyle of a homemade raw food diet, exercise, and lots of sleep. One of my favorite ingredients of the Paleo/Primal lifestyle is play. As a homeschooling momma, I have encouraged my children to play more than anything else. Through play they have created strong relationships with each other and have a strong sense of themselves. To me, play is one of the most important things we can add to our lives and sadly, I believe it is one of the biggest things missing from the lives of most people, especially those of us with rheumatoid arthritis. When I take time to let go of my pain or my "to do" lists and have fun joking with my husband or kids, I find myself living in the moment, not in rheumatoid arthritis. 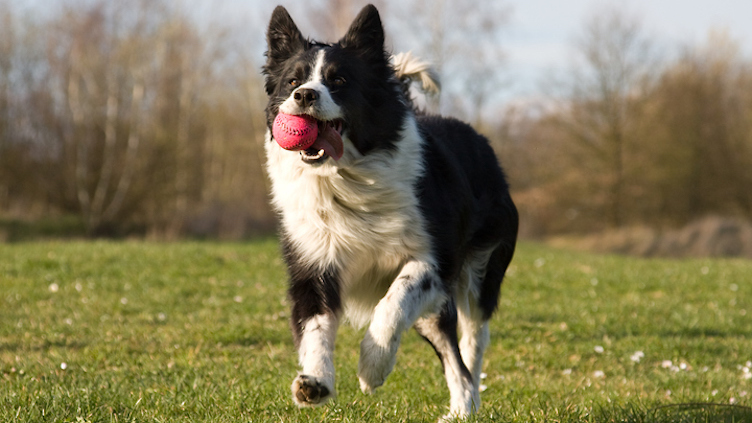 When my border collie comes to me with a ball in her mouth, I am reminded that she is in my life for a reason. She is here to keep me young. She is here to remind me to keep moving. I always feel better when I let loose and have a little fun playing. Although the main ingredient in the paleo/primal lifestyle is diet, sleep has been the spice that brings it all together for me. Within the paleo/primal lifestyle sleep and lots of it is recommended as a way to recharge our bodies. Whenever a flare is coming on, my body requires a lot of sleep. In the past, I would often ignore this need, but my body is smart and it knows what I need. My job is to listen. When my body requires a nap during the day, I now carve out whatever time I can and the results are amazing. I have incorporated this spice in my life so much that my kids now make fun of me because I am often in bed and asleep by 8:30 at night. The paleo/primal lifestyle does take some work. It requires planning out your meals and cooking at home. It may require packing up meals or snacks when away from home for long periods. This time at home cooking has it benefits though such as more time talking with your kids as they help prepare meals or even a little quiet time at the end of the day to unwind. My dad always said chopping veggies was relaxing when you let your body flow with the movements. The paleo/primal lifestyle asks that you educate yourself about the choices you are making in the foods you consume. You may have to spend a little extra time researching where your food comes from but after putting plenty of natural foods in your body, your body will thank you again and again. Plus, there is always the added benefit of meeting regularly with the farmers that are producing the food you serve your family. The paleo/primal lifestyle asks that you exercise and allow for time to play. These two can even be combined as my walks/sprints/playing with Izzy often turn out to be. And, it asks that you reward yourself with plenty of quality sleep. When you get enough sleep, your body handles life so much easier. This lifestyle may take some time to adjust to, but I feel that the paleo/primal lifestyle is one that promotes simplifying your life and when you are dealing with an autoimmune disease, I cannot think of anything more important. I cannot say that "diet" has eliminated all of my symptoms of rheumatoid arthritis but when I look at the paleo/primal lifestyle as a whole package full of lots of varying ingredients, it has definitely improved my life. In fact, it has added a lot of spice to my life. The improvement I have made in how I eat, how I exercise, and how I play gives back to me in many ways but overall it makes my whole life simpler. A simpler life improves my autoimmune disease. For me, diet and lifestyle definitely play a huge part in my rheumatoid arthritis treatment. The Paleo Solution - Everything you need to know is here. Everyday Paleo - Great recipes for an entire family. Mark's Daily Apple - This too has everything. Plus, I find this site gives me a lot of motivation through Mark's encouraging words and success stories. CHRIS KRESSER L.AC MEDICINE FOR THE 21ST CENTURY - This site provides more of the science behind the diet.